Many people might think that in more recent years, gender inequality within the workplace has vanished and everyone is now treated as equals. This assumption is very far from the truth. Women, even today, still have to deal with much discrimination and prejudice in the working environment, especially when dealing with more “male dominated” occupations such as a contractor or an engineer. Although women’s incomes have increased at almost twice the rate of men in the last century, they are still significantly lower. Women today are often overlooked when it comes to job opportunities and job advancements. Even if they are more qualified and have a higher education than a man who is also applying for the same job, the women often gets turned down because they are believed to take more time off work due to their family and future pregnancies. A good example of this the unfairness in wages among women and men is in a research study done about incomes in 2008. It states that women earned $30, 200, which is roughly 65% of the $46,900 that men had earned that same year. A reason for this gap is said to possibly be the fact that men work more hours than women on average. 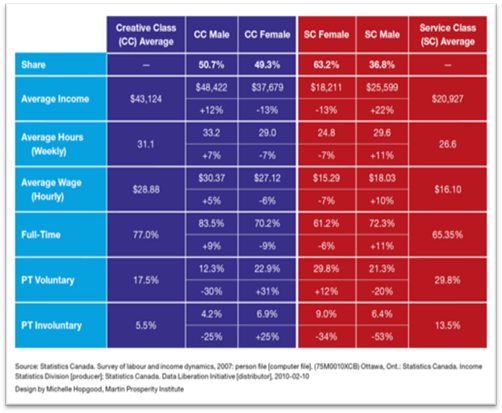 This chart shows the differences in hours, wages and more, between men and women in the CC (Creative Class) and the SC (Service Class). As you can see, in both classes men make more than the women do and get more hours. It also shows that more women may be employed in the SC, but yet the men tend to get more hours and start off at higher wages. Note: Data before 1996 are drawn from Survey of Consumer Finances (SCF) and data since 1996 are taken from the Survey of Labour and Income Dynamics (SLID). The surveys use different definitions, and as a result the number of people working full-year full-time in the SLID is smaller than in the SCF. Source: Statistics Canada, CANSIM, table (for fee) 202-0102. For more information, you can take a look at these business websites which include charts and tables that are very informative.